If you watch me teach long enough, you will see me use a variety of signs from American Sign Language (ASL). I use simple signs for nouns or commands, finger spelling to spell out words or names, and signs for some of our favorite songs. Learning the signs for spoken words has always been an interest of mine and I have found that using sign language benefits all children. Research shows that the use of sign language has proven to be beneficial to young children in many settings. Research on “Baby Sign,” teaching babies to use simple signs before they can talk, indicates that sign language hastens speech development, reduces frustration in young children by giving them a means to express themselves before they know how to talk, and can increase parent-child bonding. Signs used by young children count as actual words when calculating a young child’s vocabulary. Learning something visually as well as orally creates more neurological connections in the brain, increasing brain development. Sign language has also proven to be a successful intervention with children with special needs such as autism or Down syndrome. In addition to the documented benefits, I have my own list of the advantages of using ASL in the classroom. I’ve found that using sign language is a wonderful attention-getter. Students notice when I’m doing something unfamiliar with my hands. They want to know what I’m “saying” with my hands. I have told children that signing is like making secret messages that you have to pay attention in order to understand. I have used sign language as an instant “quiet down” strategy. The sign for “applause” can be used to give a silent cheer during a particularly exciting or silly moment in a story where raucous behavior might otherwise ensue. Also, children who are visual learners are better able to focus on a direction that is given visually as well as verbally. Using sign language is another way to communicate with children who are less verbal, or are learning English as a new language. It is also a way to introduce diversity to young children in an accessible way they can understand. I explain that some people use sign language to talk because they cannot talk with their voice or cannot hear. In preschool, we often discuss how different people need different things to help them learn, and sign language is something that can help! Most importantly, using sign language with preschoolers is fun! Children often ask what the sign is for a new word, and if I do not know it, we look it up! Many children enjoy learning the signs and doing them along with me when we sing, just as they would do the “actions” to any other preschool tune. Many of the signs for words look like the word they are representing so signs can be easy for preschoolers to learn. Whether it’s signing while singing “You Are My Sunshine” or showing preschoolers how to finger spell their names, I use sign language to expose preschoolers to yet one more way of communicating and interacting with others. I wonder what we’ll sign next! 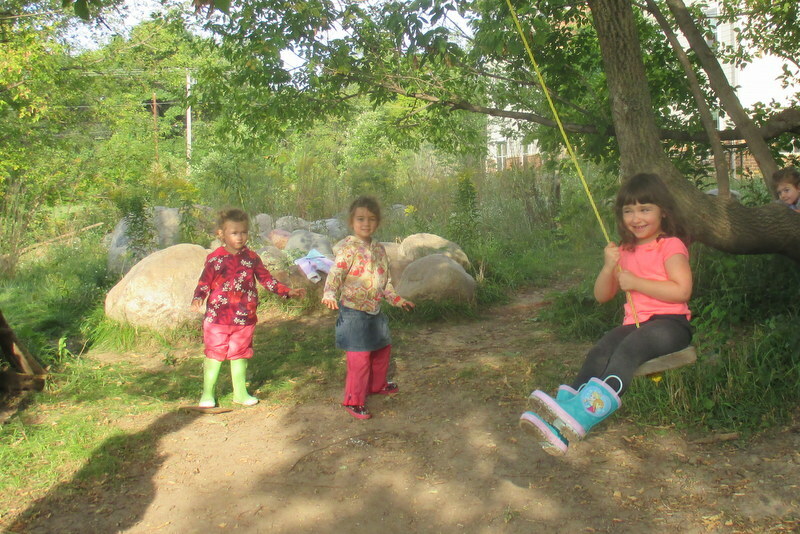 The swing is one of the children’s favorite spots in our Boulders play space. It is a disc swing, hung from one of our favorite climbing trees. Because it is a favorite, and because it only allows for one child at a time, conflict naturally arises. Some announce before we even get to the Boulders, “I’m going on the swing first!” and it’s often a race to the swing as soon as the gate opens. Inevitably, someone who was planning on a turn doesn’t get one as soon as he or she wanted it, and must wait. As a teacher, it is tempting to impose MY rules on the children’s playtime. Some children even expect it. I could say, “Johnny gets it for five minutes, then Mary gets it for five minutes.” I could take the swing away when children fight over it. I could make each child get off before they are done, leaving everyone feeling dissatisfied. But what would I be taking away from the children if I did that? It is okay – and, in fact, important – for kids to experience conflict with peers. It is part of life, and children must have the opportunity to get into it and get out of it without being rescued by an adult. Allowing children to decide the length of their turns lets them control their playtime. It gives them the opportunity to tune into their peers’ wants and needs. It is more meaningful for Johnny to get off the swing because he knows Mary is waiting than it is for him to get off because I told him to. This hands-off approach can be difficult for kids at first, especially for those who are used to adults swooping in as soon as conflict occurs. But with time and practice, children grow in their confidence to solve their own problems. This practice also increases children’s intrinsic motivation – that is, their motivation that comes from within rather than for an external reward (such as praise from an adult). While extrinsic motivation can be powerful in the short-term, it is intrinsic motivation that drives children in more meaningful ways by developing their self-concept. It’s amazing what children can do when we give them a little space to think and to solve problems on their own. I am reminded of that whenever I see the swing.